An agriculture graduate, Moses is in charge of Livestock breeding programmes, and manages the Boer goat unit. He is a skilled cattle inseminator, and has a very practical knowledge of biogas. Moses was instrumental in founding DFEFHO in 2011, and securing the 30 acres of land near Kamuli for a tree/bamboo nursery and farming demonstration area. 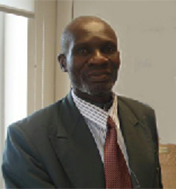 For many years he successfully headed the School links programme, leading teacher and student visits to Wales several times before retiring from teaching agriculture at Busoga High School.